The Huichol not only have to deal with threats to their sacred land by the Canadian-based mining company First Majestic Silver Corporation. 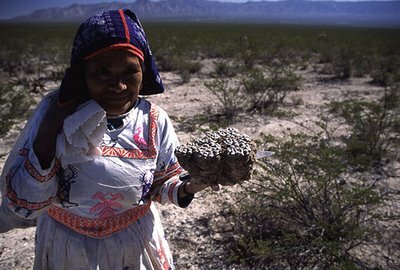 According to the Guadalajara Reporter a recent presidential decree also outlaws harvesting of peyote in two protected areas in San Luis Potosi, partly prohibiting the ancient Huichol pilgrimages that revolve around peyote picking. Not only is their sacred land threatened by Canadian mining corporations, but the indigenous Huichol or Wixarika of Jalisco and Nayarit’s Sierra Madre must now also contend with the Mexican government undermining their peyote-infused religious rituals. 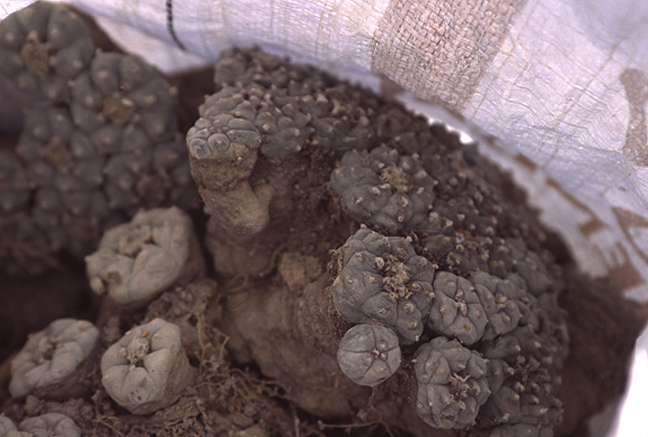 One of four Wixarika deities, peyote is considered a means of communicating with the gods, and for thousands of years the Wixarika have embarked on pilgrimages to pick the hallucinogenic cactus flower in the mountainous “Wirikuta” area of Real de Catorce in San Luis Potosi. But a presidential decree issued on October 26 partly prohibited this ancient tradition by outlawing the harvest of fruit from two protected areas in San Luis Potosi. At a press conference last week, the Regional Council for the Defense of Wirikuta, demanded that the government guarantee their right to pick peyote. The council also called for the cancellation of 79 mining concessions affecting their sacred land. Since 2009, the Wixarika have been campaigning against mining concessions granted by the Mexican government to Canadian firms. The mining has a devastating impact on the local environment, critics say, with swaths of land destroyed and large quantities of cyanide used in the process. It saddens me to see that the Huichol still have to fight for their right to their sacred areas. Areas that are threatened by a mining concession granted by Mexico's government to Canada-based First Majestic Silver Corporation. Earlier this year the Huichol, as part of their yearly pilgrimage, staged a protest against the Mexican government’s decision to allow First Majestic Silver Corporation to exploit the area. With their ancestral homeland in danger of destruction at the hands of a Canadian mining company, the indigenous Huichol people used their annual pilgrimage to stage a rally in defense of their sacred territory last week. Counting on support from their gods (as well as local media and human rights organizations), the Wixaritari, as the Huichol people traditionally call themselves, embarked upon a spiritual and political journey with the aim of drawing national attention to their predicament. Mexico’s 28,000 Wixaritari are natives of a mountainous area where northern Jalisco, eastern Nayarit, southern Durango and western Zacatecas all intersect. They originated in Wirikuta, the Huichol name for Cerro del Quemado, in Real de Catorce, San Luis Potosi. This is a sacred area for the Wixaritari, where it is said the Sun God, “Tao Jreeku,” created the world. Every year, hundreds of Wixaritari walk almost 500 kilometers to Wirikuta to pray, leave religious offerings and perform “Mitote” ceremonies with peyote, the sacred hallucinogenic cactus. 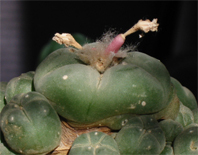 Considered a magical means of communicating with the gods, peyote is an important part of Wixaritari culture and only they are legally allowed to gather or possess the cactus. This year 800 pilgrims left their communities at the beginning of the month, arriving en masse on February 6. Normally the separate communities from different states arrive apart, but this year they coordinated their pilgrimages so as to arrive together and draw greater attention. Attended by numerous special guests – including representatives of the United Nations High Commissioner, musicians, journalists and dozens of notable non-governmental organizations and human rights groups – the event was intended to protest the Mexican government’s decision to allow a Canadian mining company to exploit the area. In November 2009, Vancouver-based First Majestic Silver Corporation bought 22 concessions from the Mexican government to explore and develop mineral deposits in a 6,327-hectare area of the Real de Catorce region. Around 70 percent of the land falls inside the sacred Wirikuta area. In 1999, UNESCO designated this site as a protected area for its importance as a cultural route and for its endemic flora and fauna species. The mining project not only infringes on sacred and protected land, but also threatens the region’s eco-system, through potential cyanide contamination and the over-exploitation of local water resources. While the federal government has shown very little interest in their concerns and First Majestic has aggressively pushed ahead with its plans, the Wixaritari have received some local backing, through the work of human rights organizations and publicity in the local media. 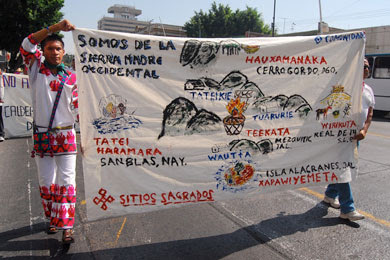 This week the Human Rights Commission of Jalisco (CEDHJ) reiterated its support for the Wixaritari in their struggle against exploitation. The CEDHJ said it is working with its national counterpart to identify potential human rights violations against the Wixaritari, who inhabit the municipalities of Mezquitic, Huejuquilla, Villa Guerrero, Chimaltitan, and Bolaños in Jalisco’s northern highlands. Much of the Wixaritari anger has been directed at the government, as President Felipe Calderon has reneged on the Huauxca Manaka Pact he witnessed in 2008, when indigenous leaders and the governors of five states vowed to protect the holy places of the Wixaritari. As a result, the Wixaritari now face the threat of spiritual extermination, in addition to the existing problems of poverty, hunger, marginalization and drought. The destruction of their sacred homeland would be a large step towards wiping out their very identity. But in a world where the market rules, ancient culture is only considered a meaningful commodity if it brings in tourism, as the ancient Mayan civilization does for Mexico. Wixaritari culture, on the other hand, does not – hence the government’s complete indifference to their plight. The ongoing dispute is an example of the dark legacy of the 1994 North American Free Trade Agreement (NAFTA), which significantly eased restrictions on foreign corporations operating in Mexico. Highly profitable companies such as First Majestic can expect to receive large federal grants to exploit Mexico’s resources, while simultaneously damaging the environment and destroying ancient indigenous culture. This is not the first time NAFTA has caused tension between the government and Mexico’s indigenous population. The Zapatista rebellion in Chiapas in 1994 was a result of the Mexican government signing away the land rights of indigenous campesinos to foreign corporations. Under the terms of NAFTA, the government removed Article 27 Section VII of the Mexican Constitution, which had previously guaranteed land reparations to indigenous groups throughout Mexico. This right to land had been the principal gain of the Mexican Revolution.